The National Board Certification English Language Arts: Adolescence and Young Adulthood Exam exam is a challenging test and your results can make a huge difference when it comes to your future. If you do well on the exam, it can open doors and lead to wonderful opportunities. If you do poorly on the National Board Certification English Language Arts: Adolescence and Young Adulthood Exam test, you will find yourself with a lot fewer options. You may have to put your plans for the future on hold, or even give up on them altogether. Preparing for your exam with our National Board Certification English Language Arts: Adolescence and Young Adulthood Exam Exam Flashcard Study System can help you avoid this fate and give you a big advantage when you sit down to take the test. 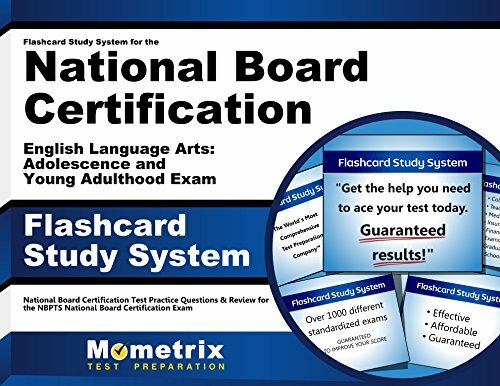 We believe in delivering lots of value for your money, so the National Board Certification English Language Arts: Adolescence and Young Adulthood Exam Exam Flashcard Study System is packed with the critical information you'll need to master in order to ace the test. Study after study has shown that spaced repetition is the most effective form of learning, and nothing beats flashcards when it comes to making repetitive learning fun and fast. National Board Certification English Language Arts: Adolescence and Young Adulthood Exam Exam Flashcard Study System uses repetitive methods of study to teach you how to break apart and quickly solve difficult National Board Certification English Language Arts: Adolescence and Young Adulthood Exam test questions on the test. If you think you're ready for the National Board Certification English Language Arts: Adolescence and Young Adulthood Exam exam, test yourself using our National Board Certification English Language Arts: Adolescence and Young Adulthood Exam questions. Find out if you're prepared or if you need to head back to the flashcards for another review. Use our National Board Certification English Language Arts: Adolescence and Young Adulthood Exam practice test questions to make sure that you're not caught off guard on test day!